In addition, Andrew has researched, written and presented numerous series for the BBC including ‘Andrew Marr's History of Modern Britain’, ‘Britain from Above’, ‘Darwin's Dangerous Idea’, ‘Andrew Marr's The Making of Modern Britain’, ‘Megacities and Andrew Marr's History of The World’ and ‘JFK-The Making of Modern Politics’. His other broadcasting achievements include a series on contemporary thinkers for BBC 2 and Radio 4, and political documentaries for Channel 4 and BBC 1's Panorama. 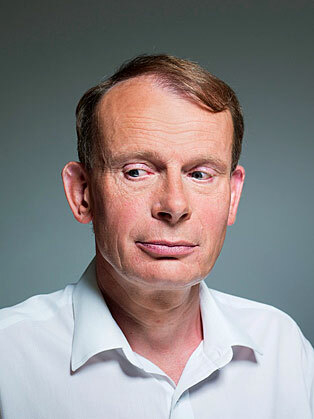 In February 2012, Andrew Marr's three-part BBC 1 documentary, ‘The Diamond Queen’, drew more than six million viewers per episode. Following Margaret Thatcher’s death in 2013, Andrew narrated a memorial documentary, ‘Margaret Thatcher: Prime Minister’ and, in 2016, Andrew produced and presented a thought provoking documentary about the ‘Battle for Scotland’. More recently, in 2017, Andrew has broadcast an in-depth documentary called ‘My Brain and Me’, where he has charted his own personal battle with his development and recovery from his stroke. In addition to broadcasting, Andrew has also found time to write his own books and had many books published, including: The Battle for Scotland, Ruling Britannia, The Day Britain Died, My Trade, A History of Modern Britain, A History of Modern Britain part 2 (best seller), The Diamond Queen: Elizabeth II and Her People, A History of the World 2012 and A Short Book about Drawing. Andrew has also written and published two mystery fiction books: ‘Children of the Master’ and ‘Head of State’. Andrew has received many major awards for writing and broadcasting - including from BAFTA, the Royal Television Society and the Broadcasting Press Guild, which awarded two prizes for the Andrew Marr Show and Andrew Marr's History of Modern Britain including the award for the ‘Best Specialist Factual Programme’ at the 2008 ceremony.